I was asked in an online speaker chat recently about my speaking and presentation background and how I was able to do it as frequently as I did and how I was paid. To answer that, it requires a little background and history and thus I wrote this for them. 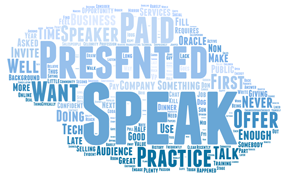 First: Let’s make it clear, Public / Business speaking is rarely a profession (consider it never). You are “somebody” first; you don’t need to be a celebrity, just somebody in something with something to say. Second: Practice, practice, practice. If you do not speak as part of your job (salespeople) or are not civically active in your community, it’s tough to practice. Your dog does not engage well enough - nor does your mirror. Being a good speaker also requires you to be social. You must be confident in what you say; a lack of confidence is evident and can kill a great presentation. Passion goes a long way as well; believe in what you are saying as well as yourself. Speaking should energize you – you should be able to draw from your audience an energy like no other. When you walk off the stage, your feet should barely be able to reach the ground. Surprisingly, I practiced first as an engineer giving presentations; then a salesperson talking and giving presentations, as a Cubmaster speaking to 40 children and their parents, then as an entrepreneur doing more selling and training. All of a sudden – I was a speaker (presented papers) with invites to various technical conferences and on behalf of companies like Oracle (CODA, IOUG and OpenWorld), Sybase, Sun Microsystems, Intermec and Brio (note: Oracle never paid me, they just gave me a bigger room). I used to speak anywhere anyone would listen (you should too). I was storytelling about my customers' successes with my companies' products and services (all the time, selling something too). So when did I find out I was good at this whole speaking thing? In the mid through the late 90s, my company was doing a great deal of contract training for Sybase. A Sybase VP asked if I would like to be a fill-in for a late cancellation at a by-invite C-Level, Non-Tech Tech dinner that Sybase did quarterly. Of course, I jumped at the opportunity. I was given the opportunity to talk about what I liked to talk about, to an audience I wanted to get to, from a non-tech perspective, and it happened to be what my audience wanted to hear. I was the popular guy to network with after the dinner and I had decision makers who all (seemed like all) wanted our services. Sybase invited me back next quarter and I was very happy to oblige. I did this for about a year and half (only rule, I could not use the “O” word (Oracle)) In my opinion, they were doing me the biggest favor in the world – easily doubling the size of my business at the time. Then it happened - I could not make it to a presentation. I let Sybase know with plenty of warning – plenty of time to get a replacement. They immediately showed their cards offering to pay me - pay me more than I could imagine, almost feeling insulted that they had not paid me for the last year and a half (remember, I would have paid them for the opportunity). As much as the offer was, I did not feel it enough to change my plans, so I said “no”. They kept upping the offer over the next 30 minutes until it was 6X their original offer – at this point I was afraid they were going to pull away, so I humbly said “Oookkk”. At a later date, I learned that Sybase valued my presentation at $250K each in incremental services and software sales. I felt special. Just an FYI, this does not work everywhere – speakers to fill slots get paid appearance fees (usually not enough to cover costs). It is when they want [Your Name] that wallets open.